When the beach isn't enough... Photo © by Judy Wells. When you tire of lolling on the beach, there is enough on North Carolina's Outer Banks (OBX) to keep you and the kids entertained. In fact our group of travel writers were so busy seeing and doing that we never had a chance to loll anywhere. Board The Elizabeth II at Roanoke Island Festival Park. Photo © by Judy Wells. and The Lost Colony Outdoor Drama, oldest in country. Downtown Manteo. Photo © by Judy Wells. Tip: Many of the stores in Manteo are at the top of a flight of stairs. Don't miss the exhibits and talk in the visitor center. Photo © by Judy Wells. Wright Brothers National Memorial, Kill Devil Hill, is one of the few places in the world where you can stand on the exact spot where history happened. This is exactly where it happened. Photo © by Judy Wells. A large boulder marks the spot where the first flight took off and smaller stones (suitable for standing on) mark the landing spots of it and three subsequent flights. Flight began here. Photo © by Judy Wells. The amazing story of that first flight will grab your imagination and the site provides the perfect backdrop for its telling although it looks nothing like it did when the Wrights were there. There were no trees - those were planted between 1902 and 1958 - and there were no dunes. It was one windswept hill and emptiness. Locals, especially the volunteer lifeguards, helped the Wrights for fun, even though it meant hauling their gliders and planes up to the top of Kill Devil Hill. Killdevil Hill in the background, replicas of the Wrights' workshop, living quarters and hangar to the right. Photo © by Judy Wells. Tip: You don't need to walk up to the hill; there's not much to see and you can drive if you're curious. Otherwise, steps and elevations are few. Pose with or try out the life-sized bronze replica. Photo © by Judy Wells. Do stop examine the copy of that first plane on your way out. Kids love climbing on it and it makes a great photo-opp. Tip: If you're a pilot, consider flying in to this still active air field. Wouldn't it be cool to land where the Wrights did? Whatever, consider man's progress: We went from first flight of 120 feet to landing on the moon in 66 years (Neil Armstrong carried with him a piece of canvas from that original plane)! Levelers may be into photographing lighthouses but few of us really want to climb to the tops. Consider visiting - it won't take long - the two here. The Gulf Stream and the Labrador Current were the I-95 of the 18th century and with ever-changing sandbars extending up to 20 miles from the island, mariners needed all the help they could get. The two currents meet at Hatteras Island and In the days of sail, if the winds were from the Northeast, ships headed North or following the Gulf Stream to Europe had to anchor and wait until the winds died down which could take days. Between currents, wind and sandbars, this dangerous stretch became known as the Graveyard of the Atlantic. Cape Hatteras Lighthouse. Photo © by Judy Wells. Cape Hatteras Lighthouse has an interesting history. At 210-feet high the tallest brick beacon in the country, it was built in 1870 some 1,500 feet from the ocean. By 1970, the shifting coast was a mere 120 feet away and threatening to destroy the landmark. By July 9, 1999 it was back on its foundation 2,900 feet inland, a bodacious project. It resumed its sentinel duties in November. Today the sea is 1,600 feet away. Bodie Island Lighthouse. Notice it's stripes are horizontal, Hatteras' are diagonal so ship captains can correctly identify them. Photo © by Judy Wells. Bodie Island's name supposedly is the result of the majority of shipwrecked bodies washing up here. It was decided in 1837 that a lighthouse was needed around Bodie Island to help southbound ships navigate the dangerous Cape Hatteras. The present Bodie Island Lighthouse is the third one - the first toppled due to a bad foundation in 1859, the second was blown up by retreating Confederate troops in 1861. The third turned on its Fresnel lens in 1872. After much renovation, it was opened to visitors this year. Bodie Island Lighthouse stairs. Photo © by Judy Wells. Tip: Bodie Lighthouse is worth going in to see its handsome staircase. Both locales include good bathroom facilities. Graveyard of the Atlantic Museum. Photo © by Judy Wells. While we're dealing with shipwrecks, don't miss the museum dedicated to the more than 1,500 that lie off the OBX and to the area's maritime history. Fresnel lens - Sherman couldn't find it but you can. Photo © by Judy Wells. Begun as a private museum, it is now state owned with a collection that includes the 1845 French Fresnel lens the Confederates buried and that Sherman couldn't find to artifacts from shipwrecks and pirates. The museum shop is worth a stop. NOAA and OSHA were born here. Photo © by Judy Wells. NOAA and OSHA were born here in this architecturally odd but distinctive two-story building that opened Jan. 1, 1902, one of 11 of the country's first official weather stations. Staff would take readings every hour and relay them to Washington, D.C., via telegraph. On April 14, 1912 the operator on duty picked up the SOS from the Titanic. When the message was relayed to the Marconi Wireless Co., no one believed it. Now an Outer Banks Visitors Center uses half of the first floor. Tip: There are 26 steps up to the top floor but nothing is there so save your energy. You won't regret a tour with Danny. Photo © by Judy Wells. The first thing I'd do is schedule a tour with Danny Couch of Hatteras Tours. He's personable, knowledgeable, a lot of fun and loves giving visitors inside info on his home. Riding on the beach is a treat. Photo © by Judy Wells. Equine Adventures offers rides for all levels of equestrians through a stream-crossed maritime forest to the beach where those who dare can gallop along the sand. Koru Village is where to head for blissful, head-to-toe pampering. Fishing boats may outnumber cars in Hatteras Village. Photo © by Judy Wells. In August, the Gulf Stream literally touches the shores of Hatteras bringing the big fish with it and anglers to the beach. Heaven for surf casters. Trophy catcher from Capt. Foster's office. Photo © by Judy Wells. If deep sea fishing is your thing - and it's one of the biggest attractions here - head to the Albatross Fleet at Foster's Quay. Since 1937 the Foster family has been taking fisherfolk to fish, landing record catches. Capt. Ernie Foster has been the second generation guide since 1958. There's always a wind and you'll find a huge selection at www.kittyhawk.com, Waves Village. Buxton Village Books. Photo © by Judy Wells. 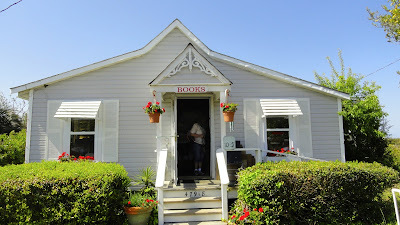 Read up on island histories (including the infamous BlueBeard), novels and best sellers at www.buxtonvillagebooks.com. April and October are the premium months for this sport. Ocracoke Ferry. Photo © by Judy Wells. Didn't have time to take the ferry from Hatteras Village to Okracoke, but it heads next-time's list. Hatteras Island, Outer Banks, N.C. Photo © by Judy Wells. Seafood lovers will like it here. So will pizza fans. From gourmet to unadorned oysters on the half shell, local treats abound. There's nothing like salt air to give you an appetite and there's nothing like the local fare to satisfy it. During a press trip in April I had a chance to try a lot of it. Alas, also during that press trip I broke my ankle which is one reason I've taken so long to share my findings with you. Most of my time was spent on the Hatteras Island but I did try two good spots to the north. Full Moon Cafe. Photo © by Judy Wells. The Full Moon Cafe and Brewery, , Manteo, serves up an outstanding lunch. Their burgers are excellent and I can personally recommend the crab and shrimp dip and the buttered pita that accompanies it. You won't want to leave a morsel of the crab and shrimp enchilada behind. The beer's good, too, and all at reasonable prices. Awful Arthur's Oyster Bar, Kill Devil Hills, a congenial, kicked-back watering hole, serves up some outstanding seafood including the best oysters I had anywhere on the Outer Banks. Chef Foutz's sausage, arugula pesto and manchego cheese appetizer. Photo © by Judy Wells. Ketch 55 Seafood Grill, Avon, garners raves from the locals. I didn't get to dine there because Chef Seth Foutz came to us, preparing supper in our rented beach house. If there is an appetizer with grilled sausage on garlic pita with arugula pesto and smoked manchego cheese, get it. Just enough nutmeg in the bisque. Photo © by Judy Wells. Crab cakes a bit overdone for my tastes. Photo © by Judy Wells. Quarterdeck Restaurant, Frisco, isn't much to look at but locals swear Miss Gina's crab cakes are the best on the island. They are good but I liked the crab bisque better. 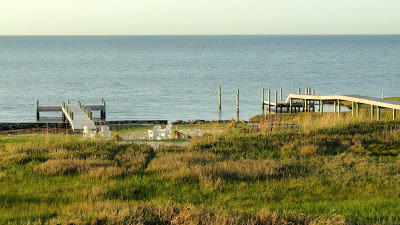 View of Pamlico Sound. Photo © by Judy Wells. Pamlico Cafe's crab cake. Yum. Photo © by Judy Wells. Pamlico Sound Bouillabaisse. Photo © by Judy Wells. 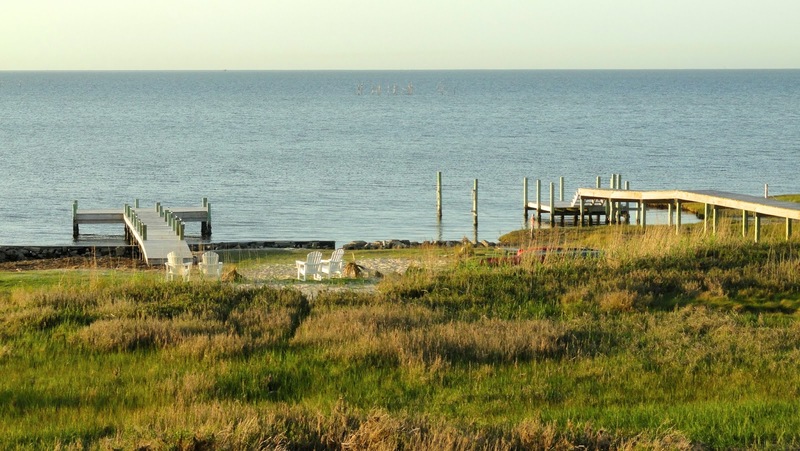 Cafe Pamlico, The Inn on Pamlico Sound, Buxton, is one of the few restaurants ever encountered where the view is equaled by the food. By far the most elegant and romantic setting, everything from drinks to desserts in this white linen establishment is memorable. The pan-seared crab cakes are to write home about. Gidget's specialty pizza. Photo © by Judy Wells. Gidget's Pizza and Pasta, Avon, is where you'll bump into the locals at lunch and it's easy to see why. Prices are extremely reasonable and the food will quickly win you over. We ordered a variety of pizzas and it was hard to pick a favorite but the Signature pizza - white garlic sauce, sliced tomatoes, fresh spinach, thinly sliced red onion, sweet red and green peppers, mild banana peppers, crisp bacon and a blend of cheeses - received many a vote. You'll need a l-o-n-g walk on the beach after this. Take that l-o-n-g walk in the morning. Photo © by Judy Wells.